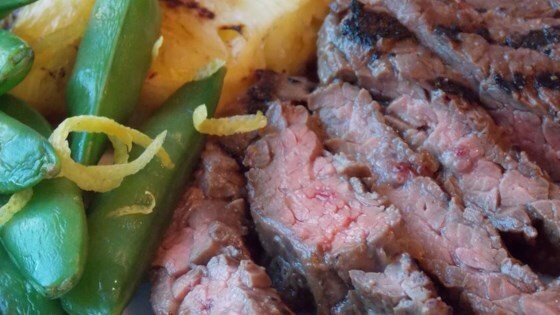 "This succulent grilled skirt steak recipe would be perfect for your summer cookout." Turn steak 90 degrees for marks...180 keeps the lines the same...someone didn't do well with highschool math! Delicious!!! I don't know where you get your skirt steaks , jcoates, but it's definitely not cheap!!! This was absolutely delicious!! Only reason for 4 stars is because of the difficulty of obtaining the yellow miso paste! Few ingredients, easy prep, love it and will do again! It was very tasy and easy to make. I did have to make an extra trip to get the Miso, but well worth it. Thanks Chef John!